· Correct some other small bugs. 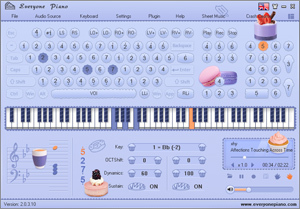 · Add function keys setting for Midi, that can be setted by right mouse button on EOP piano keyboard window. · Optimized the function to record eop file. 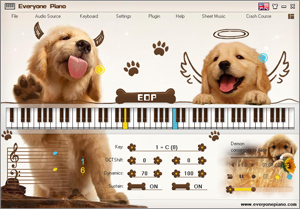 · Add function keys of " Shift Pitch with One Key" "Bimanual Dynamics" "Sustain Pedal" ect. · Modify several small bugs. · Fix the bug that can not play the EOP file when double click it after running the EOP software. · Add EOP NMN Master plugin. · Change the default musical instrument group to be the fourth. · Add the plugin manager, you can define the usually used plugins. · Set three musical instrument groups. · Update EOP Music Master Version 1.1.7.5. · Fix several keyboard modes errors. · Fix the messy code bug of the sound source window title. · Add the plugin EOP Music Master. · Add EOP Follow Me both hands prompt settings. · Add EOP Music Stand in V1.0.4.7.